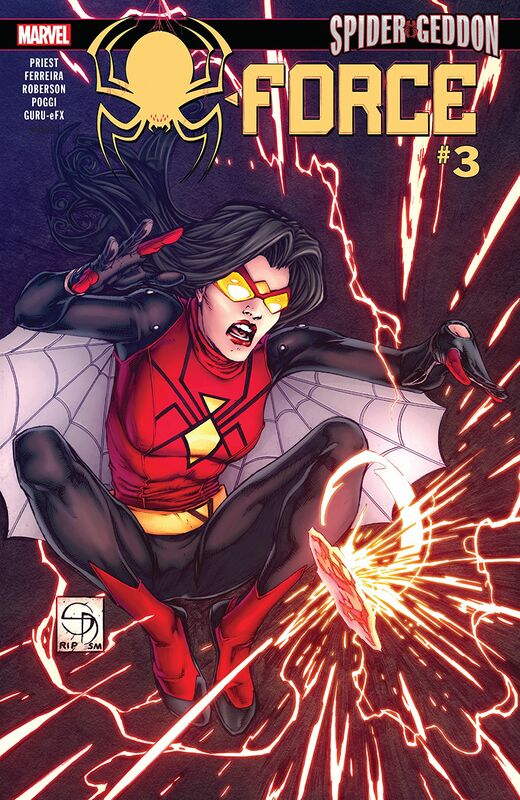 Spider-Force #3: Something serious, something nonsensical – AiPT! The conclusion of the Spider-Force miniseries brings about some of the best Inheritors characterization ever, but little else. The second issue of Spider-Force set Priest and Siqueria’s spider-strike-team (newbies Astro Spider and Spider-Kid included) story playing out in the shadow of Spider-Geddon down a confusing, needlessly edgy path that didn’t sit well with me. However, it did have one hell of a cliffhanger. Now that the payoff to that potential vampire-slaying is here with the third and final issue of this mini-series, how does the execution fare? Well, but not without faults. A compelling hook! Unfortunately, though, all of the tension there is diffused by the fact that the mystique of the premise has all but been dispelled by the happenings in Spider-Geddon #4, which to a degree, spoil the end of this very issue. So where does that leave us? With a kind of “connecting the dots” issue. Priest sets out finalizing the stories of some characters on the radiation soaked Hellscape the Spider-Force finds themselves on and getting at least one central character from here to ‘Geddon proper in a lopsided affair that’s both in service to itself, and the main event, in uneven measure. The narrative tries its best to marry the two demands but things don’t all come out even in the wash. Firstly, and most egregiously, the Spiders’ dialogue here is borderline nonsensical in trying to serve characterization but also plotting. Especially, the opening vignette, which serves little purpose aside from adding a quick complication that feels neither here nor there, packing a heel turn for a character we know next-to-nothing about. But also, on a more macro scale, where, just as in the prior issue, things feel culled from larger conversations- snippets of dialogue with little contextualization or impact that instead read coarse and mean-spirited, sometimes tense, but bereft of any meaning. The only exception is Verna, our central Inheritor, who fares significantly better. Grisly and ghastly, she is a sight to behold but also one to read. Where I normally feel that the Inheritors are a kind of interesting, but ineffective central villain — usually lacking teeth — this depiction is animalistic and righteous. Taunting her prey that they’ll die in vain, and that they are “usurpers” and “vermin” hits with a scary and resplendent impact that really, and finally, brings home just how scary a trans-dimensional life force draining vampire monster ought to be. For that, we can be thankful. Which is to say, that we can also be thankful to the artistic team here for bringing that visage to life. One page in particular, depicting the fall of one of the members o four main spider-cast at the hands of Vera is one of the most brutal, visceral, and stunning pages I have ever seen in a Spider-Man book. It’s simply astounding, and slightly unfortunate, that the artistic effort here has been regulated to a narratively weak, self-serious tie-in series, as it would be amazingly well fitted to a Carnage or Venom vs. Spidey book, but I’ll take what I can get – it’s that good. All in all, then, Spider-Force ends its tenure as perhaps the weakest Spider-Geddon tie-in. A fantastic premise burdened by needless narrative and dialogue implementation that simply refused to step back and let the art do what it was doing so well the whole time. Worth it for those interested in the bigger picture, but not a compelling standalone series by any measure. A self-serious Spider-Force finale finds the narrative repeating the same flaws that burdened the first and second issues to a detracting effect that would be almost enough to deter you from sticking around for the fantastic art, but you really should stick around for that art. Blurring the lines between gritty, dark, intense and stylishly sleek, the art here is fantastic and singularly realized. Vera reads very well, I was legitimately afraid of an Inheritor for probably the first time. Anything outside of Verna is a mishmash of dialogue snippets, severity and recursive rehashes that fails to toe that delicate line between service to characterization and plotting. Given that the ultimate reveal of this issue was already spoiled in Spider-Geddon #4, it's baffling that this was released after-the-fact.